When I started working on Propeddle, I hadn’t worked with any electronic/PCB design software for a long time. To be precise, I think the last time I used Orcad was probably during my failed attempt to get an EE degree in 1986/1987. I learned how to use Eagle because it was used by many engineers, had a decent library and there were plenty of good tutorials around. 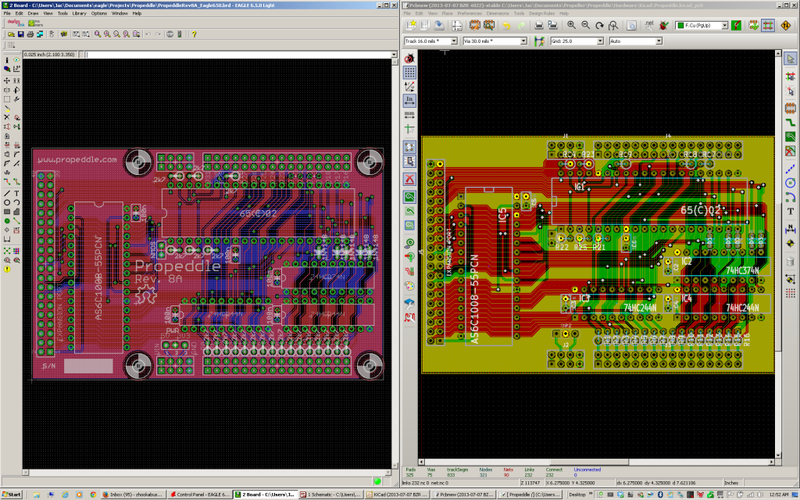 Meanwhile, I’ve also learned Designspark PCB, and Kicad, and as I mentioned before, I decided that Kicad would be the program that I would use for Propeddle, now that I can no longer use Eagle. I exported the Eagle schematic of Propeddle Rev. 8A (basically identical to Rev 8 which I sold as a kit but with the trace that was missing from the Rev 8 PCB) and solved some problems in the schematic that I already talked about, two important problems being that if two wires are linked to a bus in the same place in the schematic, Kicad connects them together too and if you Eagle schematic has special symbols for power sources, you need to remove them from your cache library after importing them in Kicad. There is currently no way to export a PCB design from Eagle to Kicad, so I decided I would re-design the Propeddle 8A circuit board, first of all to make sure that the data in the schematic is now correct, but also just to learn how to use Kicad as a tool by forcing myself to deal with things such as grid settings, DRC settings, fill zones, and subtle differences in general. Meanwhile, because I was going from an existing design, I wouldn’t have to get distracted by trying to optimize the design itself: I already know that it works the way it is, although I’m sure there’s room for improvement. Fortunately there is a lot of information available about Kicad, which helped me a lot to help me get started. But after I worked on my design for a few evenings, I hardly have to look up anything at all anymore, and I feel comfortable moving on to bigger things, literally and figuratively: the circuit board is going to be larger so it will also fit the Propeller parts and the connectors, and in Eagle I can’t enlarge the PCB without buying an expensive license. I placed all components and vias in the same locations Kicad as in Eagle. Besides the different footprints, missing mounting holes (which I just deleted because they weren’t important for this exercise anyway), missing and moved text, round pads instead of mixed round / octagonal pads, and diagonal vs. horizontal/vertical thermals, the traces are almost identical. There are a few subtle differences caused by the fact that the round pads provided less clearance than the octagonal pads in the Eagle version. So around the diodes I had to set the grid to 12.5 mils instead of 25 mils and moved some diagonal traces to a slightly different location. Other than that, the two versions are identical. Next on the agenda: Improving the schematic and adding the parts that were previously provided by other Propeller Platform hardware.